The professional and private lives of the officers from the Sun Hill police station in London's East End. Although not quite the longest-lasting - Taggart (ITV, 1983-) began a few months earlier, The Bill , at 1000 episodes, stands as the most voluminous police drama in British television history. Its longevity reflected strong writing and acting, and an adaptability that saw it change format several times. It began as Woodentop , a one-hour segment by Geoff McQueen for Thames ' Storyboard anthology (ITV, 1983) chronicling the arrival of probationary PC Jim Carver at the (fictional) Sun Hill police station in London's East End. 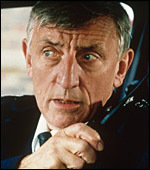 Among many popular characters to have come and gone over the years are slightly bent copper Frank Burnside (a magnetic, sneering performance by Christopher Ellison ), eternally patient desk sergeant Bob Cryer ( Eric Richard , 17 years in the role), scruffy-but-kind 'Tosh' (the late Kevin Lloyd ) and Viv Martella ( Nula Conwell ), dramatically killed-off after nine years service. The Bill began as a series of 11 one-hour episodes, retaining that format for the following three years, with top-notch scripts by McQueen , Barry Appleton and Christopher Russell and smooth direction by well-established professionals like Peter Cregeen (who set the style in Woodentop ) and Michael Ferguson . In a bold decision, the series, already shot on video rather than film, switched in 1987 to a soap-style twice-weekly half-hour format, heralding its most popular period. The show became a proving ground for rising young actors, including Robert Carlyle , Kathy Burke and Sean Bean . More recently it has attracted strong guest stars, including Denise Van Outen , Hugh Laurie and Rik Mayall (particularly good as a villain in 1997's three-part 'Humpty Dumpty'). The early introduction of a Black PC, Lyttleton ( Ronny Cush ), created a stir, as, more recently, did the first openly gay characters, PC Craig Gilmore ( Hywel Simons ) and WPC Gemma Osborne ( Jane Danson ). The Bill switched to three nights a week in January 1993, returning to twice a week in 1998 in a one-hour slot, with a more soap-like emphasis on ongoing storylines incorporating the characters' private lives. This approach seemed vindicated when, after 17 years on EastEnders (BBC, 1985-), Todd Carty signed up in July 2003. The Bill celebrated its 20th anniversary with a 'live' episode in October 2003. Following several changes in format, including a move to a post-watershed time slot, the series wasn't quite able to out-pace Taggart , and eventually came to the end of its run after 26 years with a two-part story broadcast in August 2010.